Uncle Sam will gladly pay you on Tuesday for 14 Trillion dollars today. 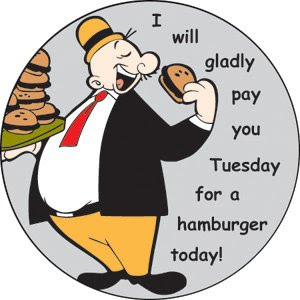 Remember the old line that Wimpy from the Popeye cartoon series would say to get a plate of hamburgers. I will gladly pay you Tuesday for a hamburger today. Hello you all, this is what the President and Congress in Washington are doing, the old Wimpy wink of the eye hamburger shuffle with your money. Congress has just passed the bill to raise the debt ceiling by 1.9 trillion for this year. Some are saying that may last only through this month of February as Congress eats more hamburgers than it can afford. This will put an additional $6,000.00 debt owed by every individual living in the United States. President Obama introduced the budget for 2011 at a record smashing 3.8 trillion dollars. Wow! These numbers are mind boggling. That will buy you a lot of burgers Wimpy. From the Wall Street Journal most economists agree the country’s public debt burden now at $7.75 trillion and growing poses a threat to economic security. Interest payments devour nearly one tenth of Federal revenues and are projected to more than triple over the next ten years. The spending for Medicare and social security consume an additional 57%. The Obama administration projects that these programs plus interest will absorb 80% of all federal revenues by 2020. Ouch! That hurts Popeye. The spending is out of control as thousands of earmarks are added to each bill that passed through congress. There is no fiscal responsibility as each senator and congressman fights to bring more hamburgers home to his own state. As of now the debt on every persons head in this country is $40,000.00 raked up by our elected officials in Washington. A quote from Senator Conrad, Democrat Senator from N. Dakota, Everyone in Washington wants to be for every tax cut and every spending increase. Senator Conrad, Popeye doesn’t see any tax cuts, just spending increases. Where is this money going? We don’t see any jobs being created. The only sector that has an increase in jobs is the Government. Government unemployment is around 3%. This is what you don’t need as they consume massive amount of cash and produce nothing. No jobs are created for the private sector. Fewer private sector jobs will reduce the revenue influx to pay for the government jobs. They will raise your taxes to keep this monster fed with plenty of hamburgers. Obama’s fix is to raise taxes on people who make over $250,000.00. Mr. President, $250,000.00 is not what it used to be. Especially if you live in California or New York. He wants to raise their income tax by 3% and capital gains by 5%. He also wants to stop subsidies for oil companies. People; this is just the bait and switch tactic. You can take all their money and it will not pay off the debt. Congress needs to stop spending, stop spending. I will say it real slooow, Stop spending Congress. Slash the excessive government jobs. Stop earmarks on bills. Cut all the wasteful programs which could save billions and billions of our hard earned money. The remedy is to cut income taxes and capital gains taxes. It works every time. Does Ronald Reagan ring a bell? This is what he did after the disaster that Jimmy Carter left You with. This tactic led to the longest non war time recovery in history. If you are old enough to remember those times, they were good. I bet you ate a lot of hamburgers. JFK did it twenty one years earlier as well with the same results. I am no economist but do know that if you eat a hamburger today and plan on paying the hamburger man on Tuesday, eventually the hamburger man will have a lot of IOU’S which does not pay the bills and the hamburger stand will close.